​Local governments in Michigan have the authority to implement local regulations that foster the health and well-being of their communities, including conserving natural resources. Zoning can be used to regulate parcel use, density of development, setbacks, impervious surfaces, type of construction, shore protection structures, landscaping, and more. It can also be used to regulate where development can and cannot take place, making it an invaluable tool in efforts to protect natural resources and environmentally sensitive areas, as well as guide development away from hazard-prone areas. 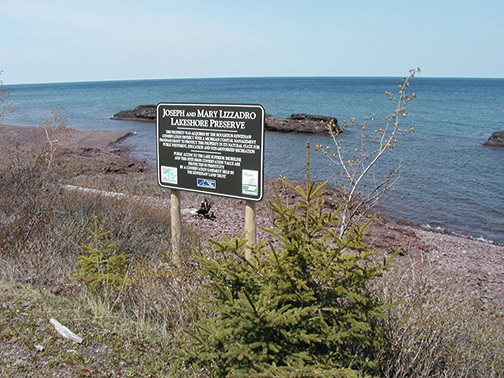 While many types of zoning can be useful as a climate adaptation strategy for all of Michigan’s waterways, wetland and floodplain ordinances are particularly beneficial climate adaptation practices for coastal wetlands. Michigan’s Wetland Protection Act, Part 303 of the Natural Resources and Environmental Protection Act (Act 451 of 1994 as amended), authorizes local units of government to adopt and administer their own wetland regulations, provided they are consistent with state regulations. Floodplain zoning ordinances regulate the types of land uses that are permitted in the floodplain, only allowing uses that are not susceptible to flood damage. Floodplains are the natural low areas adjacent to surface water bodies that hold floodwaters. 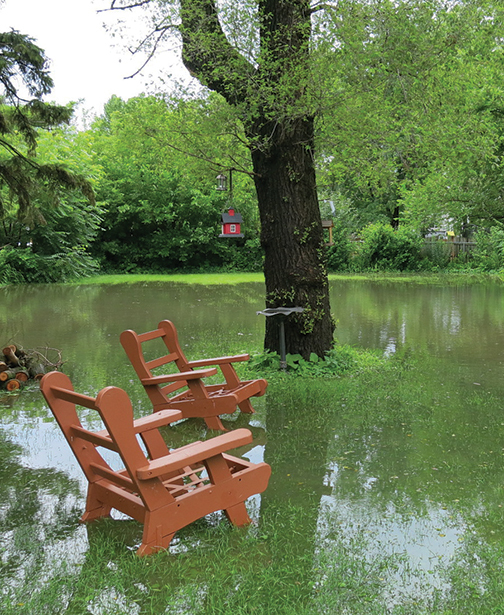 When wetlands and floodplains are altered by development including filling, dredging, and vegetation removal, their ability to handle floodwaters is greatly reduced, aggravating flooding and subsequent flood damages. Local ordinances can help prevent this from happening. Benefits of zoning can include resource conservation, open space preservation, public access, and water quality protection, all of which serve to make Michigan’s wetlands more resilient to impacts from climate change. Care must be given to integrating new standards in a way that minimizes legal risks associated with any challenge to the regulations. It is important to ensure that the municipal attorney is involved throughout the ordinance development process. Zoning regulations will need to be adaptive to accommodate climate changes. Protection and preservation of sensitive natural resources is a key climate change adaptation strategy. Conservation easements have emerged as a popular conservation tool for helping protect private land from development and overuse. A conservation easement is a legal agreement between a landowner and a land trust or government agency that can be used to protect sensitive land before it is developed and restrict activities that may impair natural processes. Easements typically apply in perpetuity and are passed on from owner to owner. Landowners who donate their easement may be eligible for federal or state tax breaks. Drafting conservation easements for long-term success requires consideration of many factors, including potential climate change impacts. Conservation easements should be designed to be adaptable, allowing managers to respond in a timely manner to changing conditions and conservation values. Conservation easements are voluntary, which can make them less effective than regulatory approaches such as setbacks and zoning. Acquiring lands that are highly susceptible to climate-induced changes could undermine the land's future value under a conservation easement. One way to protect important natural features in your community is to require “setbacks,” which are intended to provide a buffer between natural features and development. This can be accomplished by including a natural features setback as part of the zoning ordinance to ensure that buildings or various activities, such as grading or cutting vegetation, are located a safe distance from a wetland or other natural feature. Natural feature setbacks are typically 25 to 40 feet in width, but larger setbacks (up to 200 feet) are desirable for best protection of the adjacent resource. Protection of surface water runoff and water quality. Beneficial water recharge for drinking, irrigation, and other purposes. Water storage areas during storm events. Preservation of aesthetic views and enjoyment of natural resources. Stabilization of soil and prevention of erosion. Protection of wildlife habitat, including preservation of threatened and endangered species habitat. Allowing wetlands and waterbodies to change and adapt. Setbacks may need to be reassessed with changing conditions of climate change. A periodic review of setback distances will ensure that buffer zones continue to provide sufficient protection. Minimum setbacks may not adequately protect the natural vegetated boundary, nearshore habitat, and water quality. Development may already exist within setback distance, limiting its effectiveness. Site planning is an invaluable tool local governments can use when attempting to control the amount, quality, and timing of runoff to prevent its damaging effects on natural resources, private property, and public infrastructure. Site plans are the documents and drawings that present information showing what an applicant for zoning approval wants to achieve on a parcel of land. Because good site plans usually include information on stormwater, topography, soils, and wetland locations, they can help local decision makers better assess what might be necessary to protect water resources before construction begins. 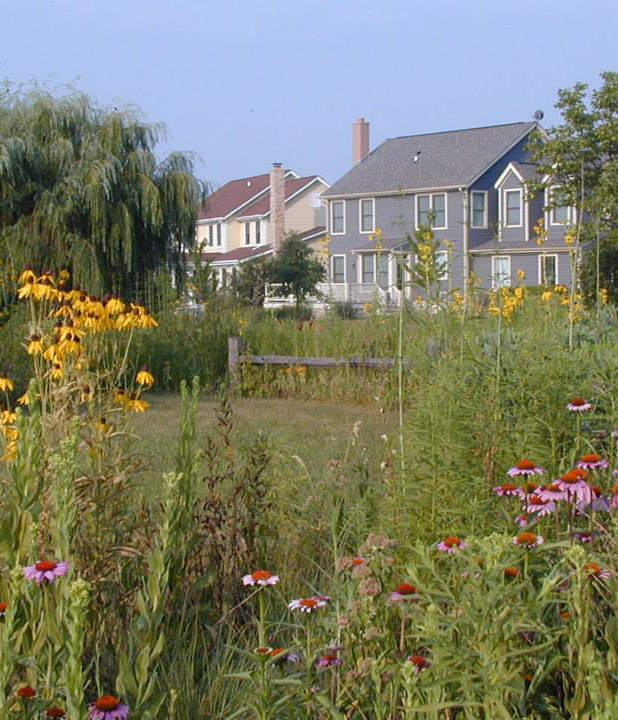 Communities can require landscaping information, use of native plant species, on-site stormwater treatment, percentage of allowable impervious coverage, and a host of other environmental design considerations through the use of site plan review. This will help improve the ability of natural systems, such as coastal wetlands, to withstand or adapt to impacts associated with climate change. Protect streambanks, shorelines, and other natural vegetation and provide setbacks. Prohibit direct discharge of stormwater into wetlands. Limit fill in wetlands, floodplains, and other natural stormwater collection areas. Limit the percentage of impervious surfaces in a development. Reduce design demands for curbs and gutters, allowing replacement with bioswales where appropriate. Require a stormwater management plan that ensures proper design, installation, and maintenance of stormwater management structures. Preserve, to the greatest extent possible, the site's pre-development drainage. Maintain habitat connectivity, migration corridors, and hydrologic connectivity and corridors. Ensure stream crossings are sized properly to accommodate flashier storm events while maintaining stable banks and streams. While site plan review is an effective zoning tool, it is generally only applied to large development projects and, therefore, may not account for wetland impacts from smaller-scale project sites. 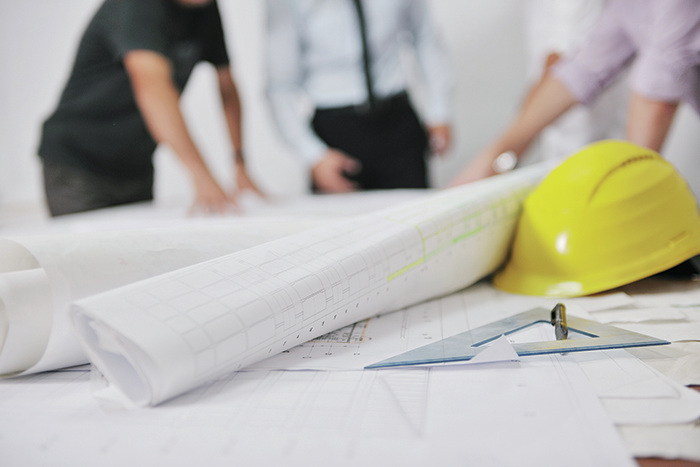 Site plan review typically requires professional assistance and trained decision makers if it is to be used most effectively. This may require hiring outside consultants, but the cost can be borne by fees paid by applicants. 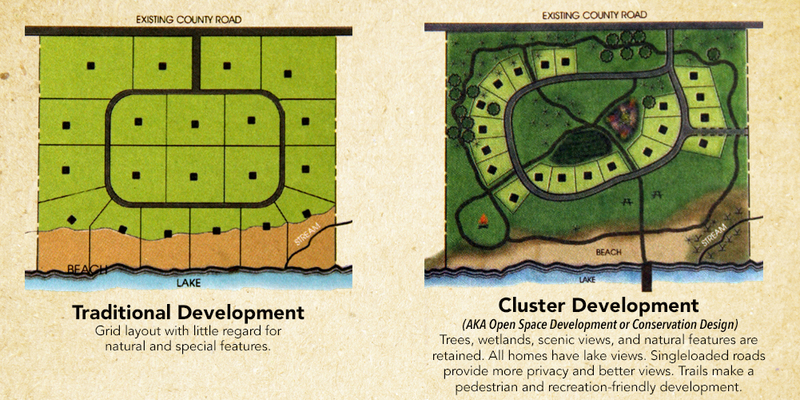 Cluster development, also called open space development or conservation design, attempts to achieve balance between growth and preservation of open space in rural and suburban settings. It is done by clustering homes on a smaller proportion of land. The additional land, which would normally be allocated to individual lots across the entire subdivision, becomes protected as common space. Providing community members with larger recreation areas and creating a sense of openness that many people desire. Providing habitat for wildlife, naturally filtering stormwater, reducing stormwater runoff from impervious surfaces, and protecting the natural features of a site. Linking the open space of several conservation design subdivisions can help develop larger and more effective “environmental corridors” within and between communities. Reduced site development costs and increased market prices of individual plots in comparison with traditional subdivisions. In many cases, local regulations must be updated to facilitate building cluster development subdivisions. The open space preserved may require maintenance by the homeowners or homeowners’ association. Stormwater and septic management often requires additional planning because it must be carefully designed for smaller lots.